Our stick flags are prefect for all flag holiday celebrations, including Memorial Day, Flag Day, 4th of July, Labor Day, and Veterans Day. Our U.S. cemetery stick flags are traditionally used to mark the graves of fallen American Serviceman who are deceased or lost their lives while in service to our country. The cemetery flags are made of our longest lasting heavyweight treated cotton and feature printed stars and stripes. The flags are mounted on wooden dowels with a gold finished spearhead at the top end. The dowels are often used in ground in a stand-alone flag display. The cemetery flags can also be paired with one of our US VETERAN grave markers to allow for a distinctive and unique tribute to your fallen hero's. 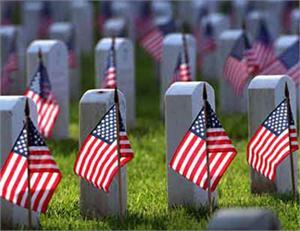 We supply Cemetery flags to Cemeteries throughout the USA. We provide Cemetery Flags to Dignity Memorial locations.